You’ve heard of the Bronx Zoo’s Cobra aka Missing In Action, the twitter sensation and New York’s most celebrated snake. 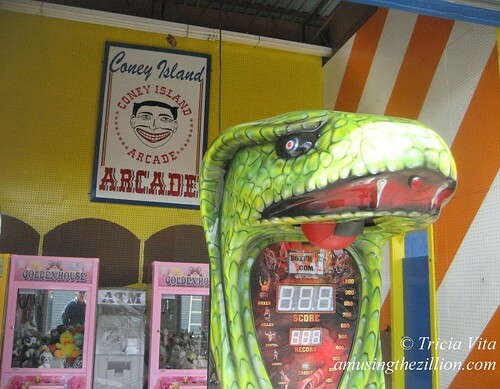 Say hello to the Coney Island Arcade Cobra! 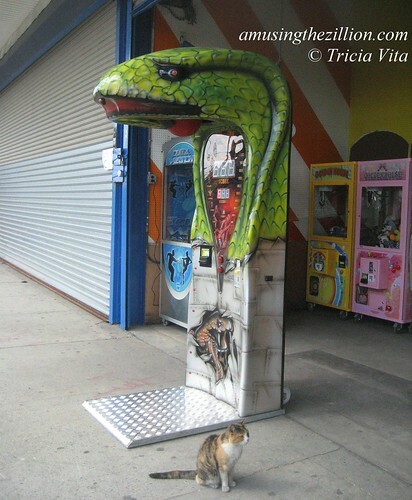 Though it’s gone unreported till now, Brooklyn has a cobra too and you can safely interact with her because she’s an arcade game. The cobra-themed “Boxer” is the newest model manufactured and distributed under the Coney Island Boxer brand by Coney arcade owner Manny Cohen and his partner Stanley Fox. 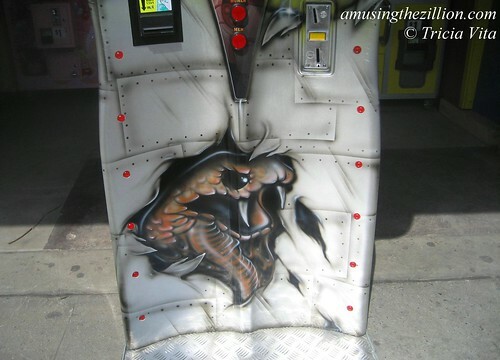 Cohen and Fox have already introduced the 300-pound machine to the amusement industry at trade shows from Vegas to China, but last week the game made its debut on Coney Island’s Bowery. You’ll find the Cobra in front of a tiny stand with a handful of other games. As you can see in the above photo, the sign for the Coney Island Arcade was resurrected. Unfortunately the arcade on 12th Street will not be rising from the ashes of the fire that destroyed it last May. ATZ has learned that the burned ruins of the building, which are a blight on the Bowery, may finally be demolished in the next few months weeks. Coney Island Arcade is the name of the arcade that Cohen has operated for more than three decades at 12th Street and the Bowery in the heart of Brooklyn’s world-famous amusement area. 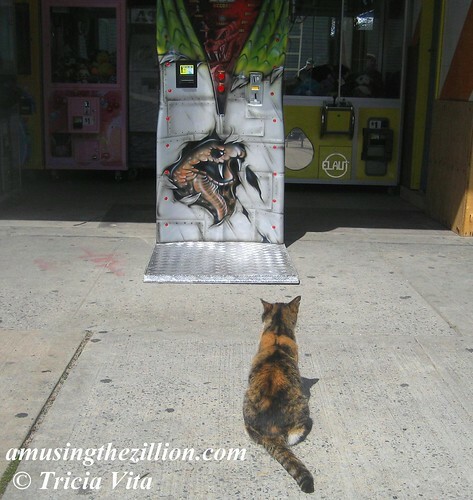 Since the fire, he has continued to operate games on the Bowery, but there’s space for only a handful of arcade machines. Alas, the Coney Island Rumor Mill is saying the owner of the building has no plans to rebuild. What’s more, penalties for “Class 1 – Immediately Hazardous” and “Class 2 – Major” ECB (Environmental Control Board) violations relating to fencing and failure to maintain the building are pending and must be resolved before a demolition permit can proceed. The Coney Island Arcade fire was our number one story of “Amusing the Zillion’s Top 10 Coney Island News Stories of 2010,” ATZ, January 1, 2011. Nobody was around to feed money to the cobra when we took these photos. She’s hungry! Stop by and play on Coney Island’s opening weekend. The boxer game is a 21st century version of the classic bag-punching machine. The concept is a classic—many manufacturers such as Sega (1960) and Zamperla (1980) have produced similar machines since the heyday of the penny and nickel bag punchers. The Coney Island Arcade Boxer is available in eight languages and features three types of games play, speed measurement, power measurement, tournament mode and high score display. The game is popular at amusement parks, bowling alleys, pool halls, sports bars and nightclubs. Hey, you can even buy one of these babies for your home rec room. I prefer my urban cobras automated. Love the meditative kitty. Fingers crossed for surviving Coney arcades. Love your comment, OWTD. The kitty says it’s like poetry! The Child’s building would be nice, but it’s a bit off the beaten path for an arcade. Location is everything, and the Child’s building is all the way over to 20th St.- 10 blocks from the amusement area. Not enough traffic down there to support the arcade. As always from you , Coney Island news good or bad always up to date. Thank you.